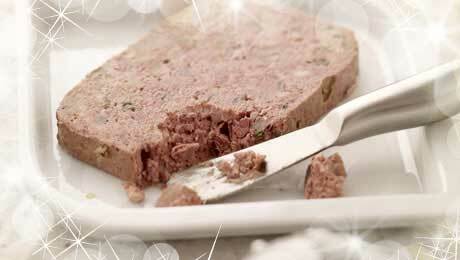 This Pâté is delicious and perfect on fresh crusty bread or crackers. Heat the oil in a frying pan and cook the bacon, onion and garlic until the onions have softened. Add the chicken livers to the pan with the bay leaves. Increase the heat and cook for 3–4 minutes, until the liver is nicely browned on the outside but still pink and soft in the centre. Move the mixture to a food processor and purée. Gradually add the softened butter, making sure not to purée too much. Season to taste and then mix in the diced prunes by hand. Divide the mixture between 6–8 small ramekins and cover with a small layer of clarified butter. Allow to rest overnight or for at least 3 hours.